It is that time of the year again. Time to reflect on the passing year and look forward to what is coming next. I think a lot of people will agree that 2016 was a challenging year to live through. A lot of disappointing things happened, expectations shattered, and hopes lost. Although for me the year started on a good note, by mid-2016 I found myself fighting deteriorating health and then later suffering through a depression due to a failing relationship. It was one hell of a ride, I was on the brink of mental collapse, and just when I was starting to recover my computer crashed, deleting most of my archives in the process. And I thought 2013 was bad. Little did I know. But putting all these unfortunate events aside, 2016 was not all bad. Even with my mishaps, there were some parts of my life that needed resetting. Nothing was lost during the computer crash because I meticulously back up my most important stuff (if there is one advice I can give you for the new year, it is to back up your files. Do it RIGHT NOW). In fact, I have so much to be grateful for. I can honestly say that this year I finally feel like I got some recognition. It started with a nice article about Epomis beetles on WIRED, and continued with a few blog posts that became very popular and attracted more followers. After years of avoidance I decided to join Twitter, and even though I am still a novice there I enjoy the interaction with other people. I managed to publish a few scientific papers, including the descriptions of new species. I even gave a filmed interview for BBC’s “Nature’s Weirdest Events” which was aired a few days ago. However, what really stood out for me this year is that I got to know a lot of people. Many people, some of whom I have never met, offered their support during my rough days. I was honored to participate in Entomological Society of Ontario’s “Bug Day Ottawa”, where I exposed the public to the wonderful world of whip spiders. I was also fortunate to personally meet up with fascinating people that I have previously known only from their online presence. I would like to extend my gratitude to everyone responsible for making my life so much more meaningful and enjoyable. I bet you want to see some photos. Because what is a photographer’s annual summary without some photos? Encountering this species was one of my highlights for the year. I know Macrodontia cervicornis very well from museum insect collections. It is one of the most impressive beetle species in the world, both in size and structure. But I never imagined I would be seeing a live one in the wild! Well let me tell you, it is hard to get over the initial impression. The male beetle that I found was not the biggest specimen, but the way it moved around still made it appear like nothing short of a monster. This species is very defensive, and getting close for the wide angle macro shot was a bit risky. The beetle responds to any approaching object with a swift biting action, and those jaws are powerful enough to cut through thick wooden branches, not to mention fingers! 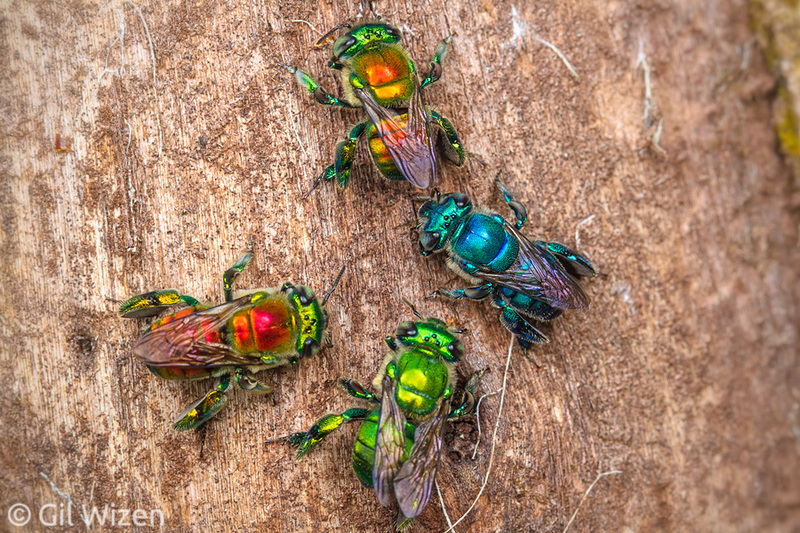 I have been observing orchid bees for a few years now. It is one of those rewarding experiences that I recommend to anyone with an interest in the natural world. While visiting Costa Rica I was fortunate to snap the above photo, showing four differently colored bees active together at the same spot. A second later the bees started to fight and eventually scattered. The photo drew a lot of attention and became viral, initiating interesting correspondences and new friendships, for which I will be forever thankful. I have always wanted a photo showing a Panacanthus cuspidatus in its charismatic threat display. However, this photo is a bit misleading. The spiny devil katydid is actually a very cute and shy animal that prefers to hide rather than attack a huge predator. It took quite a lot of “convincing” to release this behavior. OK, I am going to cheat a little in this category. This photo is not exactly non-animal because it is an animal-made structure. The “silkhenge” structure is a story that gained a lot of attention in the past few years. Initially spotted in Peru by Troy Alexander, and later revealed to the world by entomologists Phil Torres and Aaron Pomerantz, this is a intricate spider egg sac, along with a protective “fence”. While the photo is ok at best, I was extremely excited to discover this structure in the Ecuadorian Amazon. The spider species responsible for this structure is still unknown at this point (although I have my own guess for its ID). Another photo that I am very satisfied with is this interesting view of the bright colors hidden on the underside of a leaf-mimicking katydid. It belongs to my “This is not a leaf” series of closeups on katydids’ wings. In 2015 I traveled to Mindo, Ecuador in hopes to find a horned fly that Paul Bertner photographed a few years back. I managed to find it, but was unhappy with the results. I returned to the same place this year, hoping to get a better photo. But oh my, these flies are annoyingly skittish. Watch this space for an upcoming post about my experience photographing them. This photo is another highlight for me, because it depicts several interconnected biological interactions. The ants are shown tending a camouflaged treehopper to gain access to sweet honeydew secreted by the sap-sucking insect. The female treehopper is guarding her eggs, hidden in a foamy protective cover in the leaf’s central vein. And finally, there is a red parasitic mite feeding on the treehopper. The focus-stacked image of the antlered caterpillar at the end of this post took hours to produce, and I am very satisfied with the result. However, for this category I decided to choose something a little different. This landscape shot is actually not focus-stacked, but exposure-stacked. I was not carrying a tripod with me during that day but I still wanted to capture the majestic beauty of Albion falls located in Ontario, Canada. Exposure stacking and blending was a completely new technique for me, and I like how the final image turned out. It almost looks like a remote exotic location. I cannot believe this place is just a couple of hours from where I live. The above photo of a Costa Rican glass frog is probably my personal favorite from 2016. If you critically evaluate your photography work on a regular basis, it is not very often that you find yourself looking at a photograph without being able to find anything wrong with it. In the case of this photo, everything is just the way I wanted it to be. Perfect. This photo would probably not be in my “best of 2016” if it weren’t for the huge positive response from other people. This is a katydid species I have encountered many times in Ecuador, yet I could not believe my eyes when I saw how brightly colored this individual was. I posted the photo on social media and it caught on like wildfire and went viral. Some people even accused me of altering the natural colors of the katydid in photoshop. And I wonder, what a time to be alive. You travel to a remote place to bring back a piece of beautiful nature to share with others, and no one believes it is real. It makes me sad. So yes, 2016 was not easy, then again it is just a number that does not mean anything. 2017 will most likely be just as challenging. We survived last year’s events, let’s see what comes next. Bring it on! To properly welcome the new year, I am offering a product for the first time. It is a calendar containing selected photographs of one of my favorite groups of insects, the orthopterans. If you do not have a 2017 calendar yet, or if you already got one but would still like to have nice photos of katydids and grasshoppers on your wall to look at, please consider ordering one. The candy-colored katydid is featured there too! Art for scientists: Social media avatars by Ethan Kocak →← Diaethria – a festive caterpillar with antlers! 2014 in review: traveling, wide-angle macro and great finds! The candy colored katydid looks like it is mid color change after a molt. I have a picture of a completely pink one with green eyes taken right after it molted. Yes, I agree that it was probably not too long after molting. The other nymphs I found from the same katydid species had slightly less vivid colors.